Germany’s Christian Democrats elected Annegret Kramp-Karrenbauer on Friday to replace Angela Merkel as party leader, a decision that moves her into pole position to succeed Europe’s most influential leader as chancellor. Kramp-Karrenbauer, 56, is Merkel’s protege and was the continuity candidate favoured by the party elite. She won the leadership with 517 votes out of 999 votes cast by delegates. Her rival, Friedrich Merz, won 482 votes in a run-off. A former state premier in Saarland, where she led a three-way coalition, Kramp-Karrenbauer has a reputation for uniting support across the conservative Christian Democratic Union (CDU) and a talent for striking alliances with other parties. 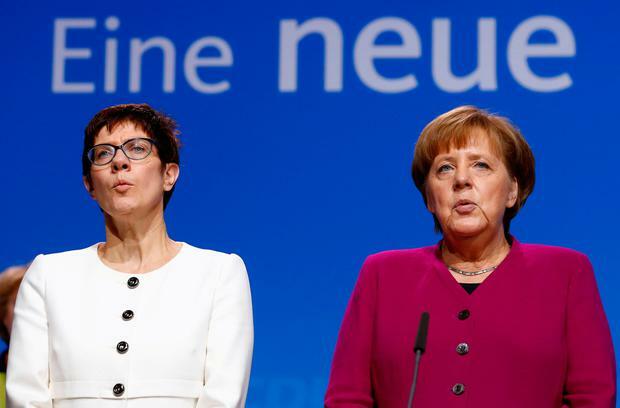 Sometimes dubbed “mini Merkel”, Kramp-Karrenbauer is admired by the CDU upper echelons for her appeal across the party. “I have read a lot about what I am and who I am: ‘mini’, a copy, simply ‘more of the same’. Dear delegates, I stand before you as I am and as life made me and I am proud of that,” Kramp-Karrenbauer said in a passionate speech to the congress. Merkel said in October she would step down as party chief but remain chancellor, an effort to manage her exit after a series of setbacks since her divisive decision in 2015 to keep German borders open to refugees fleeing war in the Middle East. There was jubilation as the result of the run-off was announced. A tearful Kramp-Karrenbauer thanked her rivals and invited them to share the stage with her in a show of party unity, which delegates applauded. Kramp-Karrenbauer has differentiated herself from Merkel on social and foreign policy by voting in favour of quotas for women on corporate boards and taking a tougher line on Russia. She told Reuters last week that Europe and the United States should consider blockading Russian ships over the Ukraine crisis. During the campaign, she took a more cautious stance on the future of Europe than Merz, who said Germany should “contribute more” to the European Union as it benefits from a euro common currency that is “too weak for our economy”. Party insiders say she gets on well with Merkel. “The chemistry is good,” said one senior CDU official.